BMW made a genuine success of the Italian original, but it was not enough to bring lasting fortunes to the company. It was still better for this type of customer to buy a used VW Beetle, which was roomier and more practical in daily use. Or, if one wanted to buy new, the four-seater Goggomobil offered more space for a growing family. BMW saw this trend early on, and brought out its four-seater BMW 600 in 1957, but it would be left to the more conventional BMW 700 to bring lasting success and initiate the companys phenomenal climb to the top levels of the European auto industry. This car is another example of a late-model European 300 sliding-window model, identifiable by its stylized script on either side of the door roundel, its narrow bright trim strips under the windows, and its wide swallow-tail rear brake/ license plate light. A single-key system for ignition and door was a welcome refinement. Mechanically, the late-type motors had a longer oil filler neck with nylon dipstick, improved valve cotters and better drive couplings by Goetze. 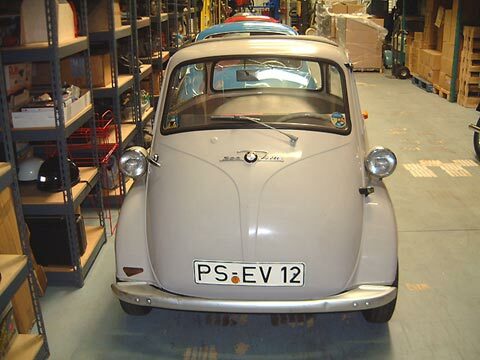 While the Isetta did not excel in any particular microcar virtue- styling, practicality, speed, economy, reliability, comfort- it was its clever, appealing combination of all of them that makes it arguably the most popular microcar of today.